I bumped into a dear old friend, the great journalist Mark O’Neill, in Hong Kong this week when he turned up at a book signing I was doing (he also wrote a kind review of my book in The South China Morning Post). 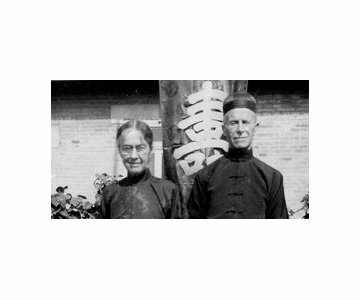 I had known that Mark’s grandfather had been a Presbyterian missionary from Northern Ireland in China before the First World War, had spent much time there and loved the country and the Chinese. I knew Mark was digging around the story with a view to a book (which is apparently now written and should be appearing in Chinese and English from a Hong Kong publisher soon – more details as soon as I hear anything). Several years ago while mooching around a second hand bookshop in London I came across a short volume of Mark’s grandfather’s memoirs which included a wonderful questionnaire at the back that was used to test young missionaries for China – question included ‘Explain the concept of purgatory in Chinese’ and ‘Describe the form and function of the Holy Trinity in Chinese’ – not easy to do that!! Anyway, catching up with Mark he told me the fantastic tale of how he discovered that his grandfather’s medal (the Order of the Striped Tiger for services to the Chinese Labour Corps in WW1 in France) was up for auction and how he bought it and rescued it from disappearing into a private collection. The whole story is here from the Irish Times – great reading. I await the book with interest – I’ll try and get Mark to send a photo of the medal too.